As a solution to this problem, Docker for Data Science proposes using Docker. You will learn how to use existing pre-compiled public images created by the major open-source technologiesâPython, Jupyter, Postgresâas well as using the Dockerfile to extend these images to suit your specific purposes. 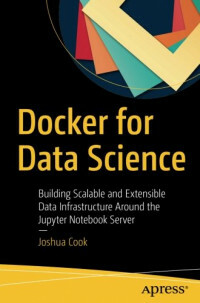 The Docker-Compose technology is examined and you will learn how it can be used to build a linked system with Python churning data behind the scenes and Jupyter managing these background tasks. Best practices in using existing images are explored as well as developing your own images to deploy state-of-the-art machine learning and optimization algorithms.